Experience West Iceland's rich history and mystical landscape This complete yet compact tour provides the essential overview of Iceland! Visit the wonderful highlights of both West and South Iceland, enjoying both natural wonders and less-crowded, tranquil wilderness views. You will be introduced to well-known natural treasures tucked along the rugged coastline of Snaefellsnes Peninsula, famous for its mystical glacier and ties to the ancient Sagas. Known as "Iceland in a Nutshell", Snaefellsnes will show you all the amazing types of landscapes and geological formations that can be found in Iceland. Each day also brings unique experiences with local traditions, such as meeting our Viking horses, and sampling freshly-caught seafood out at sea. You'll walk among the geological wonders of the Golden Circle and soak in pools fed by water from Europe's most powerful hot springs. At day's end, relax in the Icelandic countryside for optimal viewing of Northern Lights." Welcome to Iceland! Arrival in Reykjavik and shared transfer by Flybus to your hotel. Day at your leisure. Overnight in Reykjavík. Important: If you have added extra nights in Reykjavík before your tour, the guide will meet your group for the start of the tour on Day 2 according to the standard "Nature's Treasures and Northern Lights" itinerary. 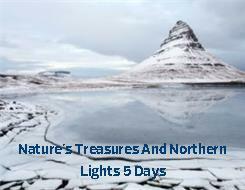 Approximate distance: ca194km / 121miles Northern Lights Centre - Lighthouse Views - Amazing hot spring baths - Unique Waterfall Duo Discover first-hand the colourful capital of Reykjavik with a short sightseeing tour. Catch the city's energetic vibe when you glimpse stunning Harpa Concert Hall and enjoy the fascinating architectural desgin of Hallgrimskirkja church. You'll also visit the fascinating Aurora Northern Lights Centre for an exciting and informative presentation on the Northern Lights. Depart Reykjavik and travel northwest via an undersea tunnel through Hvalfjordur (Whale Bay). Head to the friendly town of Akranes to visit the local Museum Centre, which preserves a comprehensive collection of geological and maritime exhibits. Afterwards, climb to the top of a lighthouse to enjoy spectacular views of the wild coastline. Head onwards to Borgarfjordur, an area rich in natural wonders and Viking history. Discover some this history at Reykholt, which holds an important role as the home of renowned medieval chieftain and Icelandic Saga writer, Snorri Sturluson. View the powerfully churning waters of Deildartunguhver, Europe's most powerful hot spring, which provides heating for most of the homes and businesses in the area. Departures from 1.October 2018 include entrance fee to the nearby Krauma, a new natural geothermal bath resort. Relax in soothing "fire and ice" baths blended from Deildartunguhver's pure hot springs and pristine glacier rivers. The day ends with a scenic visit to a duo of exceptionally beautiful and unique waterfalls at Hraunfoss and Barnafoss. Each waterfall has a mysterious secret to reveal. Dinner and overnight in the Borgarfjordur area. Evening Northern Lights Hunt: Due to the location in West Iceland away from light pollution, your group is in a prime position to hunt for the luminescent green light show that Vikings believed were Valkyries riding across the sky." Approximate distance: ca312km / 194miles "Viking Sushi" Sailing - Snaefellsjokull National Park & Glacier After breakfast, head to the delightful town of Stykkisholmur. Here you'll embark on an adventurous sail in Breidafjordur Bay (UNESCO nominee) to encounter thousands of tiny islands and experience "Viking Sushi," a sampling of sea scallops, urchin, and crab drawn onto the boat straight from the pristine Icelandic waters. Head along the rugged coastline of Snaefellsnes Peninsula. Known as "Iceland in a Nutshell" this area will show you an astonishing variety of natural landscapes from moss blanketed lava fields and pebbled beaches to imposing cliffs and the palpable force of Snaefellsjokull glacier-volcano (last eruption: 250 AD). You'll see secluded fishing villages like Grundarfjordur, with its landmark Kirkjufell Mountain and surrounding fjord teeming with herring and orca whales, and Hellnar with a year-round population of less than ten residents. The picturesque harbour village of Arnarstapi offers the opportunity to walk among columnar basalt rock formations and cliffs, swarming with colonies of seabirds. Throughout the day, savour the remote tranquility of Snaefelljokull National Park. Dinner and overnight again in Borgarnes area. Evening Northern Lights Hunt: If weather conditions the night before were unfavourable, there is another hunt for the elusive Aurora Borealis. Ideal meteorological conditions include a clear sky with icy temperatures and, preferably, no moon." Approximate distance: ca370km / 168miles National Park with Geological Wonders (UNESCO) - Exploding Geysers - The Famous Golden Falls Iceland's Golden Circle showcases a trio of celebrated natural attractions, including the dramatic Gullfoss waterfall and the geothermal fields of Geysir Hot Spring Area, alive with boiling mud pits, steam vents, and exploding geysers. Its centerpiece is Thingvellir National Park (UNESCO World Heritage Site), where Viking settlers established an annual assembly in AD 930 which has become the world's oldest ongoing parliament. Thingvellir is also a geological masterpiece, as it marks the visible site of the mid-Atlantic Ridge where the North American and Eurasian continental plates meet. During the day, visit Fridheimar, greenhouse and horse breeding farm, for an educational and interesting inter-action with the Icelandic horses and viewing how Icelandic farmers use the geothermal water for producing vegetables, even in winter time. After an amazing journey, the road takes you to Reykjavik, where the evening is at your own leisure. Dinner is on your own. Breakfast at hotel. Transfer to Keflavik International Airport for your flight. We recommend departing your hotel no later than 3-4 hours before your flight. Please note that northern lights are dependent on weather conditions. Sightings cannot be guaranteed.